Carolyn Croons has been designing since 2001. She was inspired by a group of friends who also had a love for stitching and designing cross stitch. By having a love for the arts she decided to start designing and teaching her own cross stitch. 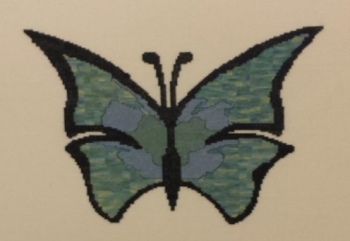 And since then Chen Designs has been a needlework design company devoted to encouragement of the needle arts. Done on 25 count Ivory Lugana the stitch count is 150 w x 117 h, it uses Gloriana and Splendor.